Gelleesh: A Crazy Thing Called Love – Based On A True Story of Everyone? A Crazy Thing Called Love – Based On A True Story of Everyone? A Crazy Thing Called Love is a Thai movie about Nam (Pimchanok Lerwisetpibol), an unattractive nerdy looking high school girl who has developed a crush on Chone (Mario Maurer), a senior and an official heartthrob on their school. Nam did everything to make Chone like her. She transformed from being a complete loser to being the school’s prettiest and most popular girl all because she wants Chone to notice her. This movie had been a big hit in the Philippines because of how a lot of girls relate to Nam’s situation when they have a high school crush. I remember when I was still in high school; I had a crush that is 2 years older than I am. I would also pass by where he is and walk slowly and with full poise. That is why I laughed so hard at the part where Nam walked by Chone’s class room. This is a very cute movie which every girl would surely love. I thought, at first, that this is a Korean movie since we all know that only Korean, Chinese and Japanese movie can get this cute. Thailand has really been coming up with good movies which have international potential. They have started with the horror movie genre and now they are tapping the romantic-comedy genre. What I love with this movie is the emotion it gives you. You will definitely feel for Nam and will wish for the other girls to keep their paws off of Chone. I also love the fact that CHONE IS SUPER CUTE. I know that just sounded so high school; but he really is! The movie showed high school love and friendship, which is what we can all relate to. 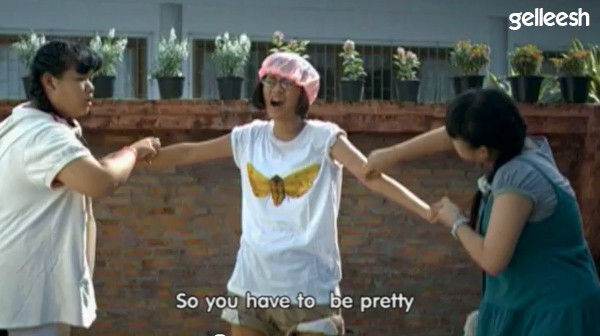 What I don’t like about the movie is that Nam has gone pretty; but her friends never changed. It’s like they focused their whole high school life in making Nam the best and forgetting about themselves. Oh, and if you watch the ending, it was quite not realistic. The what-you-do-when-you-have-a-crush-in-high school is what I can relate to but I am not a big fan of the ending. I am not a movie critic; but if I would be rating this movie, it would be a 7/10 for me. You will love it and enjoy it so much; but I am sorry because the ending really isn’t very realistic for me.